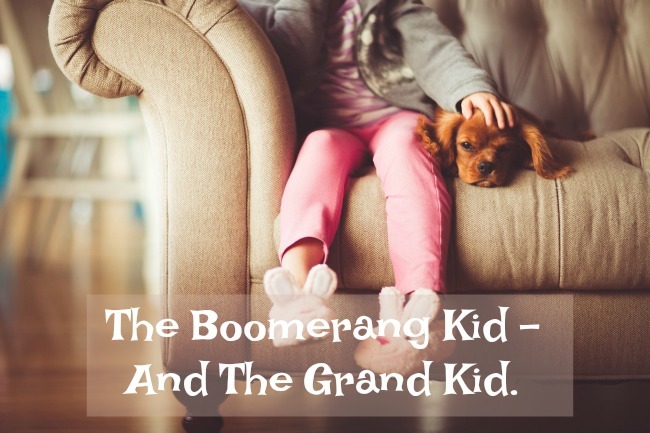 The Boomerang Kid - And The Grand Kid. A Grandfathers View. I was chatting to an old friend the other day and the conversation inevitably got around to grandchildren. He mentioned how his daughter and grandchild were living with them, and the problems this causes. I know a lot of our readers are in similar situations and asked him to share with us. This is his story in his own words. Being a grandparent was something that I had never envisaged would happen to me and I suppose I am not alone since it happens to people on a daily basis. Our daughter C, gave birth to Little C in June 2014. C and her partner A had split up at one stage and got back together. C moved out from the family home to live with A and whilst we were far from enamoured with him, she seemed to be happy and we tried our best to get on with him. We were concerned however, that the issues that had caused C and A to split up initially had really only been papered over; but we hoped that we would be proved wrong. The concept of boomerang kid is not one that would appear to be particularly difficult to understand. For a variety of reasons some young people find themselves not able to cope financially and can easily fall into debt. House prices have risen to the point that many cannot get onto the property ladder in the way that we did. Rental property in certain hotspots of which Cardiff appears to be one, have also risen to unaffordable highs and what is available is not of a particularly good standard. The only refuge for some is to return to the family home so you’re beginning to get the picture of what has happened here. A has a few ‘issues’ which appears to include an inability to live within his means and so had become what I think is termed credit blacklisted. So when the landlord of the house they were all living in announced that he wanted to sell the property and gave them six months to get out there was pressure on the relationship. The upshot of this is that C and Little C are now living with us in the family home as a temporary measure. How temporary this proves to be is an imponderable although the seemingly inevitable has happened and C and A have decided to split up since living apart. The move from the rented property happened. My wife and I pretty much organised everything since A seemed to be overwhelmed by inertia. Possibly because he was in denial about what had happened and was due to end up back at his his mother’s. We had sorted out the sleeping arrangements at our house and at the end of a long day we were glad to get Little C to bed and open a bottle of wine. That’s pretty much where we are still but are now entering phase 2 of this rescue mission and the tension of three generations living together rears up from time to time. Who is responsible when we are all together for Little C’s discipline? Are we expected to provide the childcare at any given time? Our house is not geared up for an excitable 3 year old that seems to need to be occupied all the time. She seems to know which literal and metaphorical buttons to press. There is a swing of emotions and she can be happily playing one moment and then crying the next for no apparent reason. As time goes on during the day she can turn from the sweetest child imaginable into a ball of constant whinging. I accept that this is not unusual for a child of this age to do this. We were able to cope with this for one day a week and the occasional weekend but we are finding this hard. In addition we are getting caught up in C and A’s dispute which is not our business in some respects, but obviously it does affect us. I feel resentful that this situation has impacted on our retirement. I feel guilty that I feel that way. I hold other competing emotions. I try to remember how we coped when our children were this age but it often doesn’t help. Little C is of course the innocent victim in all this and we have to make this work. There are days when she is utterly delightful but at the moment it feels like a struggle and it is taking its toll on us. I know that and it will get better and I hope this happens soon. In the meantime we have to head off now to collect Little C from her father and commence the fractious countdown until bedtime…wish us all luck. Do you have grandchildren living with you, or do you live with grandparents? What problems did you encounter and have you found any solutions?